SendSafely is proud to announce that our SendSafely Dropzone has been honored as a Bronze Winner in the 2018 CyberSecurity Awards for Secure File Transfer. The Awards honor individuals, products and companies that demonstrate excellence, innovation and leadership in information security. Winners were selected based on the strength of their nomination and by popular vote by members of the Information Security Community. With over 400 entries in more than 70 categories, the 2018 awards were highly competitive. 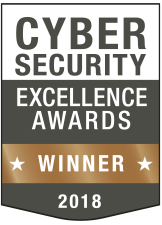 The full list of winners is available on the 2018 Cybersecurity Excellence Awards website.